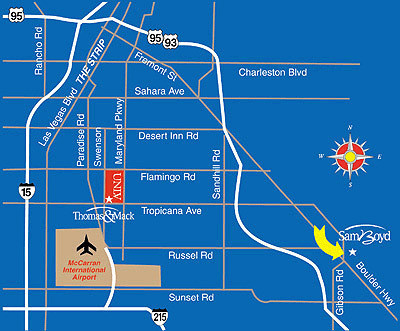 The Sam Boyd Stadium is located on 7000 East Russell Rd., Las Vegas. Exit on Tropicana, take Tropicana east exit. Take Tropicana to past Boulder Highway. Stadium will be on left side. Exit on Russell Rd., head east and drive straight to Sam Boyd Stadium. Exit to I-95 South. Take Russell Rd. exit, head east and drive straight to Sam Boyd Stadium. Continue on I-95 South past I-15 and through downtown. Exit on Russell Rd., head east and drive straight to Sam Boyd Stadium.